There are a number of benefits to extrusions as opposed to casting or forging metal parts. These benefits are particularly apparent in pieces that are near net shape and produced in long lengths. One of the challenges extruders have is that their use for complex parts can be limited. This is why it is so valuable to work with a turnkey manufacturing partner who can “finish” the job to create superior end products. Extruding is a metal forming process that forces a workpiece through a die of a smaller cross-section to form a piece of the desired length, width, and shape. The produced piece will be of the same cross-section through the length of the piece, which will vary upon the amount of work material extruded. Often, round billets are used in the extrusion process to produce smaller diameter rods, hollow tubes, or U-channel shaped extrusions. Metals that are commonly extruded include aluminum, steel, copper, lead, and magnesium, and end applications for metal extrusion include appliance and cabinet handles, handrails, pipes, and posts. Each extrusion process has its own pros and cons, but it should be understood that raw extrusions are a commodity with limited complexity. While some metal fabricators do offer reasonably priced straight extensions, much of the real value as a far as an end product that meets or exceeds OEM expectations is in the finishing process. Frequently, issues arise when the fabricator’s specialty is not bending, drilling, brushing, painting, or otherwise finishing the piece. This is where working with a manufacturing partner with the capabilities to “finish” the job when it comes to raw extrusions is so valuable. Simply put, many raw extruders can’t handle taking a complex extrusion to satisfactory completion of the desired form, fit, and function. At Mills Products, we work with many of our OEM partners to develop cost-effective secondary work solutions for turning a raw extrusion into a finished part. We provide a high level of finish and forming complexities that add real value. We can manipulate raw extrusions, bending them to specific radius or angle and even assembling them. While we are not an extruder, we are post work experts on raw extrusions, offering a variety of finishing capabilities and expertise following the extrusion process including cutting, bending, brushing, machining, and more. This, in fact, is one of our core competencies as a turnkey metal fabricator: Taking a metallic part and improving the end product through extensive value added work. We’ve been putting trim around the glass in ovens for more than 50 years. This experience translates well to complex parts/assemblies in other major appliances and applications, such as refrigerator shelving and racks, oven and cabinet handles, and more. Depending on your needs, the metal extrusion process may be a preferred choice to casting or forging. But, you will likely need at least some form of finishing work to bring real value to your parts. We are experts at machining, finishing, cutting and even assembling a wide-array of metal workpieces to meet even the most demanding tolerances. Mill Products is driven by innovation. We place a high value on providing quality, cost-effective services for our customers, without exception. Since 1945, we’ve built our reputation on producing aesthetically-superior parts and making new or existing components stronger, lighter, and more economical. 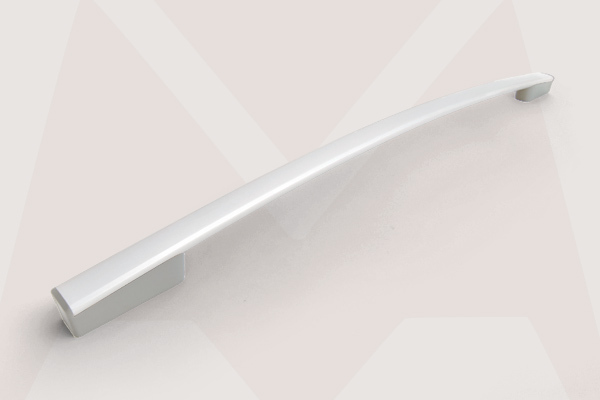 To learn more about how Mills can turn your raw extrusion into a superior end product that meets the highest aesthetic and quality demands, please contact us today.